Last year the development was mostly head and chassis. This year's major surgery is a new short stroke crank and the cams. This task should not be underestimated. Almost no engine component remains unchanged. Modified... crankcase mouths, pushrods, pushrod tubes, head steady, exhaust pipe. As Phase 1...Head, until MkII 34mm Concentric is fitted! OK... the oil pump remains as was! 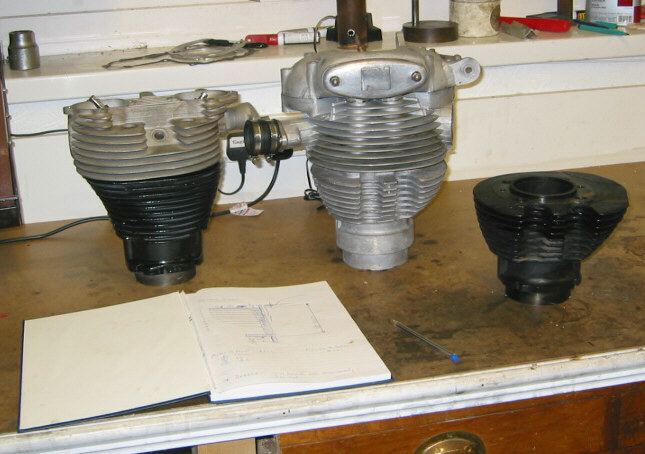 The 86mm bore coupled with an 86mm stroke happens to keep the bike at the 500cc mark, just like a Velocette!. A 14% reduction in stroke should give me more than the revs I am seeking. I have acquired an un-machined alloy casting of a Model 50 barrel. The Model 50 stroke is 88mm, leaving a convenient margine for finishing. Research shows that cost is not a factor when deciding whether to use a steel sleeve for the bore or to chrome the alloy internal working surface. 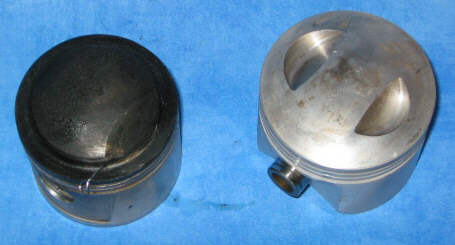 So, in order to leave as much material as possible for the spiggot that will protrude down into the crankcase mouth, and to reduce dead weight, I will go with the all alloy solution. The lack of differential expansion with alloy barrels and alloy piston means that the clearance can be run much finer, something like 0.0015"
Differential expansion does however need to be considered when designing the squish band as there is an alloy barrel and steel con rod. The squish would increase as temperature rises. This is the opposite of the Commando situation with alloy rods and steel barrels.